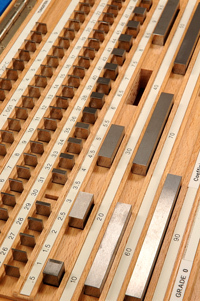 Euromet Project 601, “Supplementary Comparison on Calibration of Gauge Blocks by Mechanical Comparison”, 2003. EUROMET.L-K1.1, “Calibration of gauge blocks by interferometry”, 2004. BIPM.L-K11, “Key comparison on primary wavelength standards”, 2005. EURAMET.L-K3a.2011 “Angle comparison using an autocollimator”, ongoing.